LIAM ANDERSON (Redwood/NC) -- Anderson made it easy for us here as running away from the best in the nation at NXN over the last 400 meters to the title! This was after a third-place finish in 2017 and most overlook how he also qualified (22nd place) as a sophomore in 2016. He shined on the Woodward Park course, crossing for his second straight Division III individual title this season while his 14:55.3 was the fastest at the State Meet. Matriculating to Stanford next year, the three-time North Coast Section champ patiently waited until November to reveal his best, ending the season undefeated and achieving all of his goals! EVAN BATES (West Ranch/SS) -- Perhaps, the toughest designee among our First-Team selections, his runner-up finish at the California State Meet in the Division I race tilted in favor of Bates. Improving by over a minute from 2017, his 15:05.3 was one of the biggest surprises of the meet. He was the catalyst for his West Ranch crew that finished only 11 points behind Great Oak en route to an eighth-place finish at NXN. While only seventh at the Division I CIF-SS Finals, his effort was one of the best across the board over the course of the entire 2018 season. WILLIAM FRANKENFELD (Long Beach Poly/SS) -- Going into the cross country season with the dubious honor of running a 9:09 for the 3200 at the CIF-SS Division I Prelims and NOT advancing, Frankenfeld knew what it was like to have a season end prematurely. That was NOT the case this fall as he won the CIF-SS Division I title, leading his squad to another State Meet berth. In Fresno, he excelled with his fourth place (15:08.5) finish. But more impressive was his fourth-place finish at the Foot Locker Western Regionals to extend his season one more week, where he earned All-American status with his 14th place finish at the Foot Locker Nationals. NOAH HIBBARD (Arroyo/SS) -- Hibbard established himself as one of the best in California with his runner-up performance at the CIF-SS Division II Finals, where he was the fastest senior on that day. More impressive was his 15:05.3, second place finish to Newbury Park's Nico Young (again) at the California State Meet. Declining an invite to NXN, he comfortably qualified to the Foot Locker National Finals a week later with a fifth-place finish. Keep in mind that Hibbard's best in 2017 was a 14th place finish at the divisional finals, but looked like a seasoned veteran as he elevated himself among the best seniors in California for 2018! CONNOR LIVINGSTON (De La Salle/NC) -- Livingston was another that used the last several weeks of the season to leapfrog himself onto our First Team selections. Crossing in sixth place at the State Meet for Division 2, he just missed receiving an invite to NXN. Taking full advantage, he traveled south to the Foot Locker Western Regionals where he placed seventh. Despite two solid races in back-to-back weeks, Livingston dug deeper for his best performance of 2018 with his 15th place effort at the Foot Locker Nationals. The two-time North Coast Section champion used the last two weeks to justify his status as one of the top seven seniors in California! KEVIN RAMOS (Rubidoux/SS) -- Going into the State Meet, one could argue that Ramos had the best 2018 resume of any senior. But for the second year in a row, he had to settle for a runner-up spot to Liam Anderson at the State Meet for Division III. Invited for another trip to NXN, the only hiccup this season was his 44th place finish there. But, the Mt. SAC Sweeps champion, two-time CIF-SS Division III champion, Inland Empire Champion and runner-up at Woodbridge had a season to remember. Before NXN, Ramos had only lost to Anderson and Nico Young -- the top senior and the top junior, respectively, at NXN! JACOB STANFORD (La Costa Canyon/SD) - We originally placed him as a Second-Team selection, but could not overlook his 37th place finish at NXN, which made us reevaluate and place him as one of our top seven seniors! At NXN, he was the fourth fastest Californian, leading his squad to a surprising 11th place team finish. He was fifth-place (15:11.7) a week before at the State Meet for Division II. After taking third in 2016, second in 2017, Stanford crossed as the San Diego Section champ in 2018. His 14:57 effort at the Mt. SAC Invite along with his 15:22.7 performance at the Mt. Carmel Invite added to his resume. Ethan Danforth (Canyon Country Canyon/SS) -- Third-place finish (15:05.6) at the State Meet for Division II; overcame summer injury lending to a slow start in September; third-place finish at the CIF-SS Finals and Foothill League Champion; VERY difficult to exclude him from the first-team selections! Loic Scomparin (Dublin/NC) -- Sixth place finish (15:12.2) at the State Meet to lead Dublin to a fourth-place team finish for Division I and receive an invite to NXN; North Coast Section champ and 14:07.1 at the Woodbridge Invite. Ryan Shields (Great Oak/SS) -- Shined in November when his squad needed him most with a 10th-place finish (15:17.0) for the State Champs; surprised with a fifth-place finish at the CIF-SS Finals and solid 57th place performance at NXN to help his squad to the runner-up plaque. 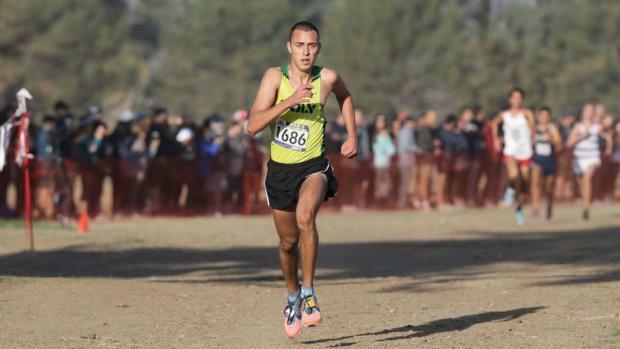 Jonathan Velasco (Mission Hills/SD) -- A Foot Locker National Finalist does not break into the first team? 16th place (15:25.0) performance at the State Meet in Division I was backed up by a surprising ninth-place finish at the Foot Locker Western Regionals and even MORE impressive 20th place finish at the Foot Locker Nationals! Alexis Garcia (Newport Harbor/SS) -- Seventh-place finish (15:23.1) at the State Meet for Division II; Sixth-place at the CIF-SS Finals a week earlier; three-time State Meet finalist as an individual. Cameron Hylton (Great Oak/SS) -- 15th place finish (15:24.6) at State Meet for Division I; 10th-place at the CIF-SS Finals; was solid down the stretch for the State Champs and NXN runners-up. Marcus Mota (Stockdale/CS) -- 12th place finish (15:21.1) at State Meet for Division I; Central Section Champion; 14:05.4, third-place finish at the Woodbridge Invite. Henry Saul (Palo Alto/CC) -- Ninth place finish (15:15.4) at State Meet for Division I; Central Coast Section Champion; very tough to not place him as a second-team selection! Ryan Smithers (Laguna Beach/SS) -- Runner-up finish (15:27.8) at State Meet for Division IV, leading his squad to the Team Title; Surprise CIF-SS Finals Division IV Champion; 11th place finish at the Foot Locker Western Regionals and may have qualified if not for a stumble over the last 10 meters. 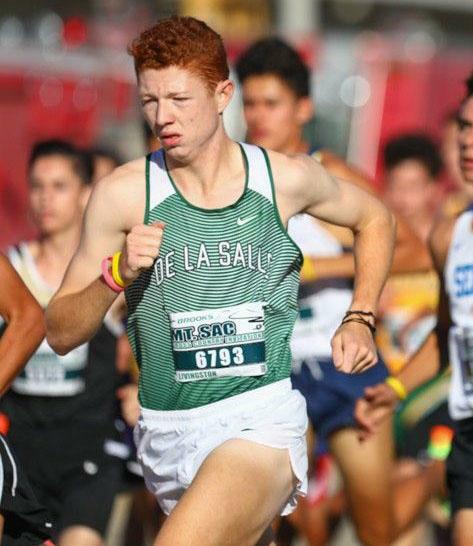 Garrett Stanford (La Costa Canyon/SD) -- Ninth-place (15:28.2) at the State Meet for Division II; San Diego Section runner-up (to his twin brother); 54th place finish at NXN (10th fastest Californian). Russell Sullivan (Foothill/NC) -- Eighth place finish (15:26.9) at the State Meet for Division III; East Bay Athletic League runner-up and third at the North Coast Section finals; 15:00 at the Mt. SAC Invite. Colton Colonna (St. Francis/CC); Ryan Cowgill (Claremont/SS); Eric Eng (St. Francis/CC); Garrett Gough (Nevada Union/SJ); Brayden McLaughlin (Del Oro/SJ); Josh O'Neill (Trabuco Hills/SS); Henry Pick (Foothill Technology/SS); Ethan Ronk (Newbury Park/SS), Manan Vats (Crescenta Valley/SS).